Pennsylvania’s congressional districts are often cited as some of the most gerrymandered in the country. One of the more improbable (and encouraging) developments in President Trump's America has been the rise of public interest in the arcane art of gerrymandering. The term gerrymandering — denoting efforts to draw political maps in a way that strongly benefits one faction or party — dates back nearly to the dawn of the republic. Patrick Henry was one of the earliest practitioners of this dark art. What changed recently is that new mapping software and the rise of Big Data now enable political operatives to engage in laser surgery that produces jagged, grotesque districts sorting voters with diabolical precision. The U.S. Supreme Court already has on its docket for this term two cases, one challenging a blatant Republican gerrymander in Wisconsin, the other challenging an over-the-top Democratic map in Maryland. An appeals court panel recently threw out North Carolina's congressional map from 2011, saying it unconstitutionally favored Republican candidates. That case has been appealed to the high court, as has a similar suit challenging Pennsylvania's congressional map, which led a different judicial panel to rule the opposite way from the Carolina case. Finally, in Pennsylvania, the supreme court struck down the state's Congressional map, finding it in violation of the state constitution. This judicial review is long overdue. As gerrymandering has grown more precisely and perniciously partisan, it has robbed more voters of meaningful choices at the polls. And it has fueled hyper-partisanship and its cousin, gridlock. Politicians nestled into artificially safe districts see no need to listen to the other side or to compromise. The only way they can lose is a primary challenge from someone on the even more extreme fringes of their party. Gerrymandering also creates swaths of voters whose needs incumbents can safely ignore, a kind of political redlining. The current Pennsylvania map does this to struggling cities such as Chester (an afterthought in Rep. Bob Brady's Philly-dominated First District) and even wealthy (and increasingly purple) Montgomery County, which the 2011 map carved into five districts in a bid to keep the suburban delegation red. It's time for the courts to declare that the naked partisanship and incumbent protection that our two-party duopoly routinely demonstrates in its map-making have gone too far. Lest we forget, our Constitution says nothing about political parties or their iron control over the conduct of elections. And the courts would will do well to heed George Washington's warning in his farewell address: "However [political parties] may now and then answer popular ends, they are likely…to become potent engines, by which cunning, ambitious, and unprincipled men will be enabled to subvert the power of the people and to usurp for themselves the reins of government …"
But even robust court rulings are necessary, but far from sufficient, to restore fairness and common sense to the process. Just as the civil rights movement needed both litigation and activism to change hearts, minds, and laws, so too will redistricting reform. 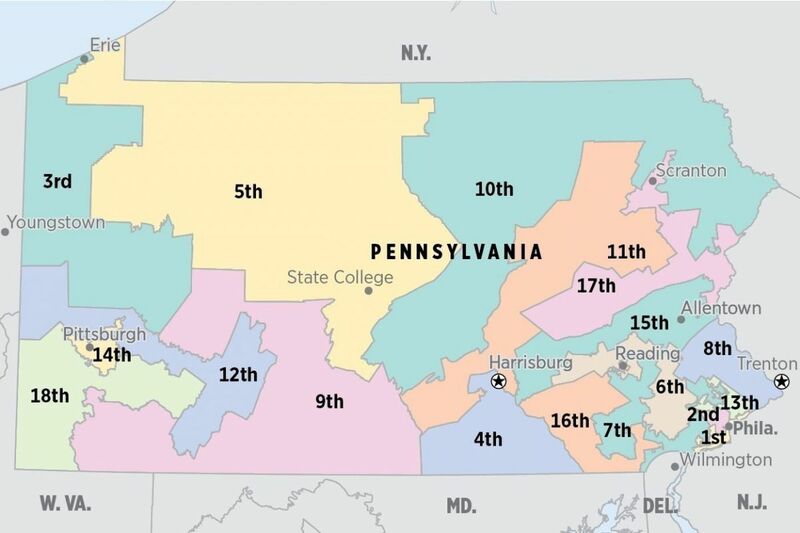 Over the last year, the all-volunteer army of Fair Districts PA (FDPA) has done an astounding job of educating voters and making the case for an independent citizens commission to draw political maps. Getting this constitutional amendment approved is a multi-year journey. But this proposal, despite having 99 House and 13 Senate co-sponsors, can't even get out of the garage. Committee Chairs Rep. Daryl Metcalfe and Sen. Mike Folmer are keeping it bottled up in their committees, without so much as a hearing. This is outrageous, an affront to every voter and a mockery of democratic process. But the voice of the people must be heard. Later this year the Committee of Seventy will launch a statewide public mapping competition called Draw the Lines (www.drawthelinespa.org) , which will put in the hands of any Pennsylvanian the same data and digital pens that now only the political operatives control. Over the next three years, as the political and legal challenges continue, Draw the Lines will enable an army of 10,000 map-wielding citizens, high school students to senior citizens, to pierce the veil of secrecy, bring the conversation out into the open, and demonstrate that at the end of the day political maps must also be tried in the court of common sense and community.